Evening dinner at the Hotel. Today after the breakfast we’ll be touring around the Kathmandu valley. The Durbar Square, Swoyambhunath Stupa, Pashupatinath temple and Boudhanath Stupa are the major sight-seeing areas around the Kathmandu valley. These all are listed in a world heritage sites. The Durbar square shows us the regal life of ancient periods. Pashupatinath temple is one of the most scared Hindu pilgrimages. Swoyambhunath temple and Boudhanath stupa is the Buddhist temple which is very popular around the globe. Swoyambhunath is also known as money temple stands on the hilltop west of the Kathmandu valley. It can also be known as the view point of Kathmandu valley. Boudhanath temple is the biggest Chorten ever made around the world. Later on, after the sight-seeing we will introduce to our fellow participants and discuss our trip preparations. Today we will fly to Pokhara a short scenic 25 minutes flight. On arrival at Pokhara airport we are transferred to Hotel. Remaining afternoon at leisure or stroll around Lakeside. Early morning we will fly to Jomsom which takes approx. 20 minutes having close views of Annapurna Range, Dhaulagiri and others. Upon landing at the airport, we will meet with our crew members and head out for Kagbeni. It takes about 3.5 hrs walk to reach Kagbeni from Jomsom. On reaching the Kagbeni Village, we will complete our paperwork at police check post before entering this long forbidden region of Nepal. From Samar, we climbto a ridge and then descend into a large gorge past a Chorten. We then pass through the Ranchug cave, one of the holiest places in Mustang. We then cross a stream, climb a pass and then descend along a ridge to Shyangmochen. From there the trail climbs gently to Geling. From Geling, we head west, climbing gently through fields to Tama Gaun. Then we head north to reach Nyi La (4020m). We then descend down from the pass and after 30 minutes’ walk, we come to a trail junction from where we head straight to Dakmar Village. After early breakfast, we head out for a long day walk to Lo Manthang. We will pass through Lo Gekar and Ghar Gumba (Monastery) which is one of the major attraction of the day. Explore the fascinating city of Lo Manthang. Today we will visit the four major temples Namgyal Gompa (situated on the hilltop and also used as a local court), Champa Lakhang (God House), Thugchen Gompa and Chyodi Gompa. Other attraction is the king's palace an imposing building in the center of the city and is occupied by the current King and Queen. We begin our return journey from Lo Manthang,to Yara passing by Sungden Chorten.The trail then gently climbs on the ridge viewing the scenic landscapes. After an hour steep descend we again come to a wide highland and descend rocky gully and knee crunching trail until reaching Dhi village. 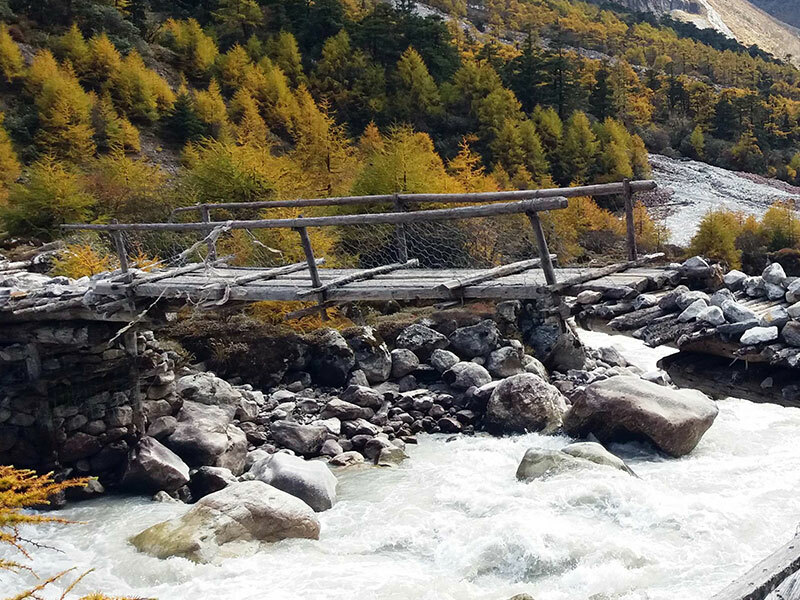 We cross by a suspension bridge over the Kaligandaki River and make a short steep climb following PuyungKho lato Yara village. Today is the rest day at Yara village to explore the surroundings. We take a day trip to Luri Gompa (Monastery) which is considered as one of the mighty holistic place. We set out early for a long day walk to Tangye village. The trail first goes through short but steep ascend and becomes long flat way before stepping down to Dechhyang Khola. Afterwards the trail goes up and down and then we are on a huge plateau crossing it to reach Tangya village. Today will along descend to Chuksang which takes approx. 8 hrs walk. We start off early leaving the village and crossing a suspension bridge, following a short river route. We then cross the river and steeply climb up passing small passes along the way we reach the hill top. Further, descend down until reaching the village of Chuksang. 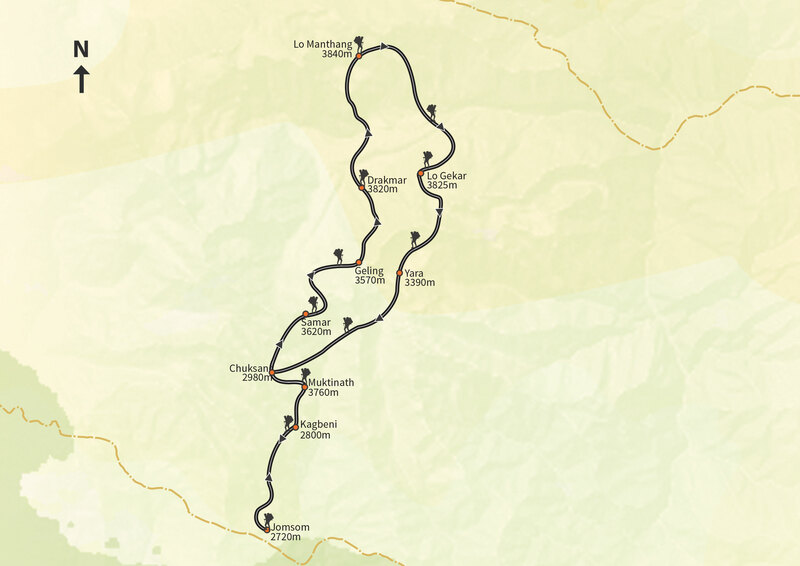 Today we descend down to Muktinath which takes approx. 6 hrs walk. We descend down through the Tetang village. After a steep climb, we come to a view point from where we can have a panoramic view of Mt. Dhaulagiri, Annapurna and Tukuche Himalayan range. Then we descend down crossing a small stream by a suspension bridge to the village of Chhyongar. We then follow the level trail until reaching Muktinath. Today we leave Muktinath and descend down to Jharkot village where we visit the ancient Sakyamuni Buddhist Monastery and Traditional Medical Center and then to Ekalbhatte and to Jomsom. 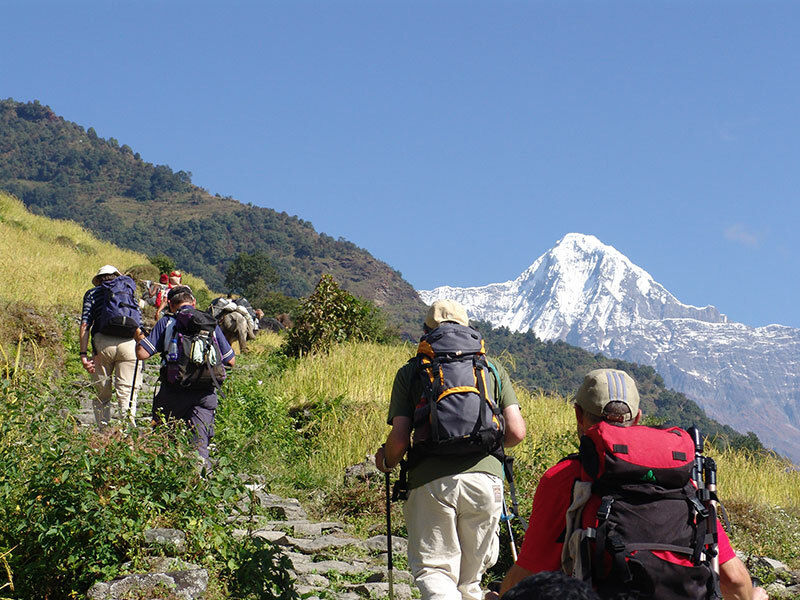 This tour spends four nights in a hotel in Kathmandu, 1 night in Pokhara and twelve nights on the trek in lodges (tea houses).